My friend's mom (Hi, Shelby!) asked her daughter's friends to contribute a page for a scrapbook for Reid's upcoming birthday. I thought it was a really creative, heartfelt idea. And then I thought about it some more, what I was going to put on that 8"x8" page, what I was going to write, did I have any pictures of us together? I started panicking. I don't know exactly why I don't scrapbook. Maybe it's the black cloud of a perpetually unfinished project hanging over my head. It's just not fun for me; I feel like it's overkill. I'd rather just look through a photo album with no embellishment. I am missing the embellishment gene, which makes it hard for me to tell jokes longer than a one-liner. (Two peanuts walked into a bar and one was a-salted.) And scrapbooks seem to need embellishment. It's like scrapbooking is so permanent and I don't want to mess up and say something dorky that will be passed on for generations. I want it to be timeless and witty, and that just seems so formal. Much like the eight years we spent observing young parents and what not do, I've seen a lot of scrapbooks that turned me off of that craft genre (and subsequently saved me a bunch of money). Highly embellished three-dimensional pages with cutesy fonts and themes, seven pictures, and a paragraph longer than the original event it chronicled. This past Christmas I put my scrapbook aversion aside and put together a photo book (I used Costco's website) for my parents and in-laws. It had only photos, and after seeing the beautiful one my sister-in-law did I realized that captions are for other people's sake and are indeed helpful. Next year. I thought about going to the craft store and finding the requisite cute papers and rivets and stickers to do this page for the birthday gift, but first I turned to my pal Google and discovered digital scrapbooking. There are lots of available page templates along the lines of The Cutest Blog on the Block blog templates, and I even started putting one together until it got complicated with registration, membership, and printing. So I went back to the first idea and logged onto the Costco photo center to have prints made (a rarity when compared to how many pictures I take). I noticed that one size option was 8"x8", so it got my wheels turning. I wound up using Photoshop (stick to what you know!) 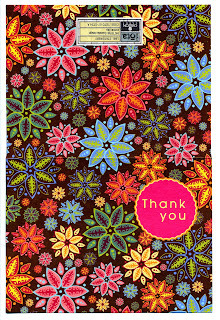 and this image of a thank-you note from my friend Liz, which I scanned a couple years ago. The page you completed is beautiful. Glad you gave it a try. I do love your finished product though, very fresh and very you... Good job. It's beautiful, Anne- couldn't be more perfect..... Thank you so much!